Coriander/ Kothimeera / Cilantro is considered a digestive aid, which stimulates the appetite and aids in the secretion of gastric juices. It also releases heat (fever) from the body.These are highly nutritive and good for health. Small kids will like it very very much. Amma makes it quite frequently. It is the favorite of my whole family and even my little one likes it very much. 1. First take a bunch of coriander and wash it cleanly and dry it. 2. Grind mung into a little coarse mixture like rava without adding water. Remove the mixture into a bowl. 3. 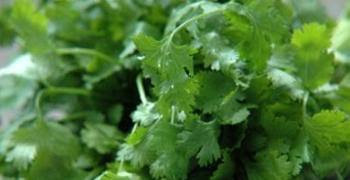 Now cut the coriander finely and mix it with the coarse Mung. 4. Now grind green chillies into a smooth paste and mix it with the coriander and mung mixture. 5. Add salt required as per taste. Mix all ingredients well. 6. Heat oil in pan on medium high heat enough for deep frying . 7. Take 1 inch sized ball out of above coriander-mung mixture in your hand and place the ball on left hand and press it lightly to form a tikki. 8. Deep fry these tikkis until light brown on both the sides. 9. Drain on absorbent paper . 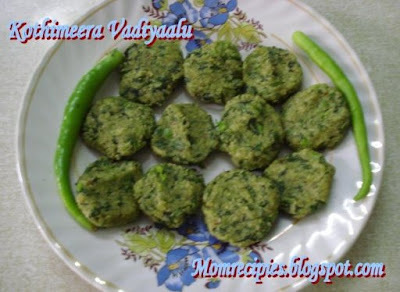 Very pretty ur green vadas! Nice color and perfect snack I am so tempted to have some now!!! Moong and cilantro.....wow awesome combo...Looks yum..
Wow nice combo and colour, i was misleaded by the name.We call it vada. 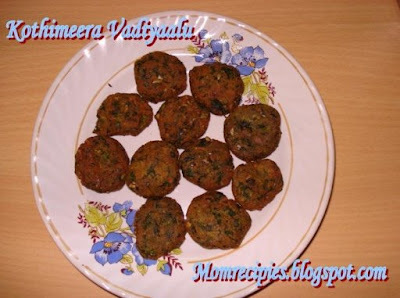 wooo green vadas looks mouthwtering...i guess adding of mint too gives the freshness to vadas..will try ..
Hi Sireesha, the vada looks grt! Awesome combo of moong and cilantro.. Thanks for introducing me to a new way to use cilantro. such a lovely color for vadas! They look so yummy. Lovely color. Vada looks crispy & tasty. Vadas looks gr8! Must have tasted yum yumm..